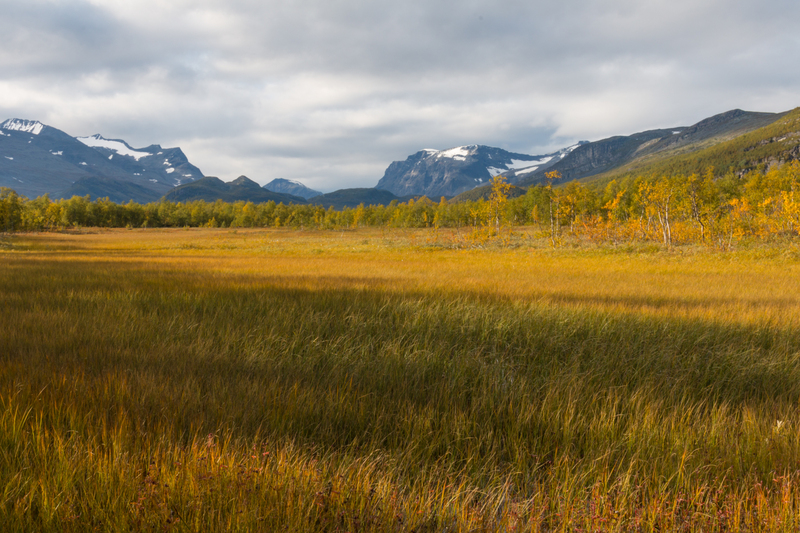 There are a few options to get to Sarek National Park. The closest cities you can reach by plane or train are Gällivare and Kiruna. The closest one is Gällivare and you can fly with Nextjet Airlines from Stockholm. The train from Stockholm to Narvik also stops at Gällivare and Kiruna. 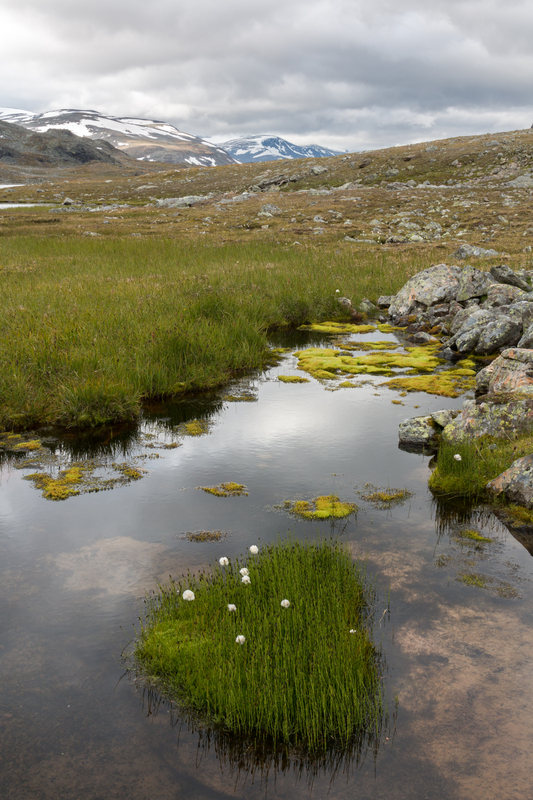 There are also a few entry points to get into the heart of Sarek. You can take the bus from Gällivare to any of the following entry points. From Kebnats you take the ferry across the lake to Saltoloukta STF Mountain hut. This takes only 15 minutes. The bus connects with the ferry in both directions. 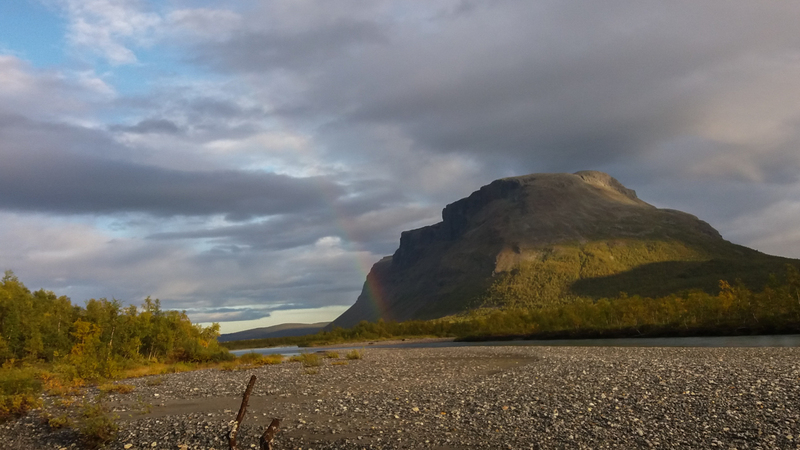 Reaching Sarek will take you about 2 days over the Kungsleden trail and crossing Sitojaure (where there is a STF hut as well) by speedboat or by using the rowboats that are provided. But I would suggest taking the speedboat because it is a tiring crossing of 5 km which can be tricky with bad weather. Another fact is that there are 3 boats and there always have to be minimum 2 boats on 1 side. So if there is only 1 on your side this means you will have to bring 1 boat back once you reach the other side. Like this you will have to cross the lake 3 times. This might take a few hours. Keep in mind that you might have to wait a few hours before the speedboat shows up as well. 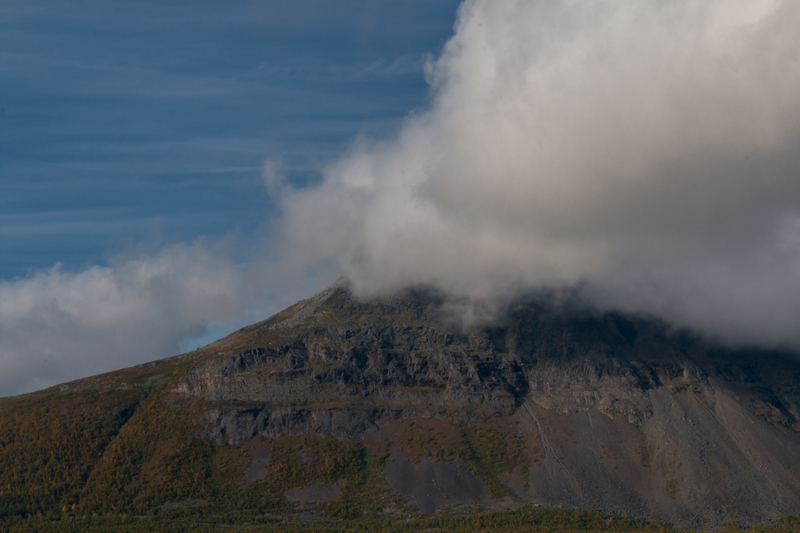 Just before you reach Akste you can leave the Kungsleden into Sarek by crossing the iconical Skierfe cliff. It’s a great idea to camp at the saddle and watch the sunrise over Rapadalen from the top of Skierfe! This is actually not the best option because it involves a longer boat crossing to Saltoluokta. 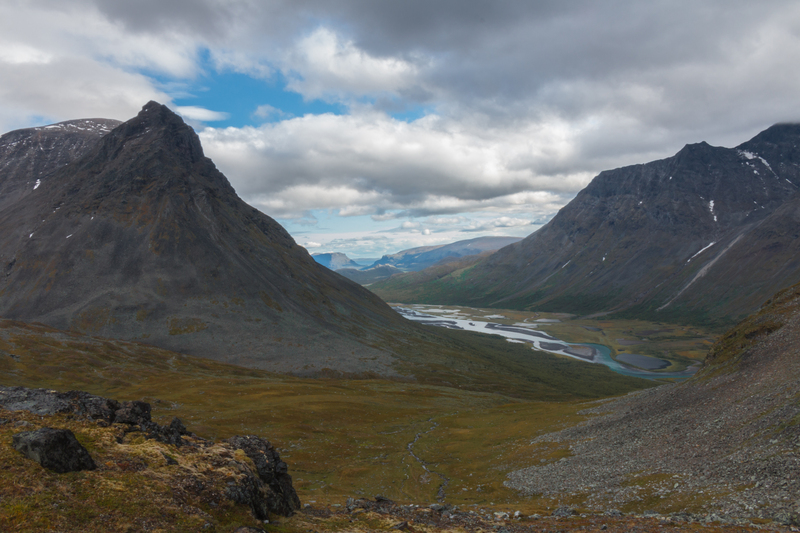 This is a very difficult entry into Sarek. I used this entry and the first two days were a battle with trees, swamp, rock fields and nasty mosquitos. 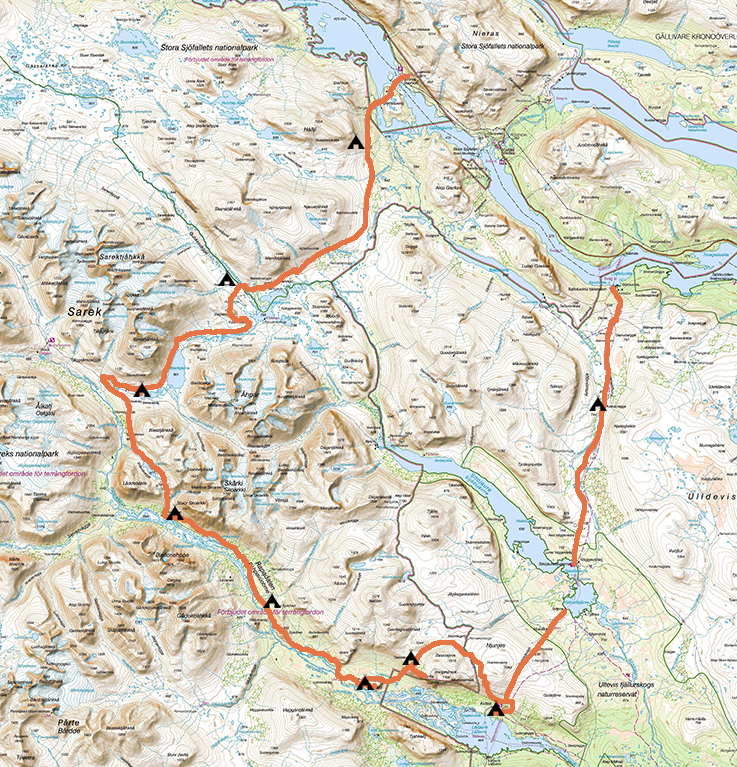 If you like to suffer then this is the perfect entry into Sarek! The bus will drop you at the parking area near the entry gate of the dam. You can open the door inside the gate to enter. Just follow the main road that goes over the hill and crosses to the other side of the dam. It’s about 3 km to the other side. From here I followed the road (just stay near the water) all the way to the end where the reindeer corral ends. There is a small trail that goes into the trees and bushes right next to the corral. From here the battle begins. 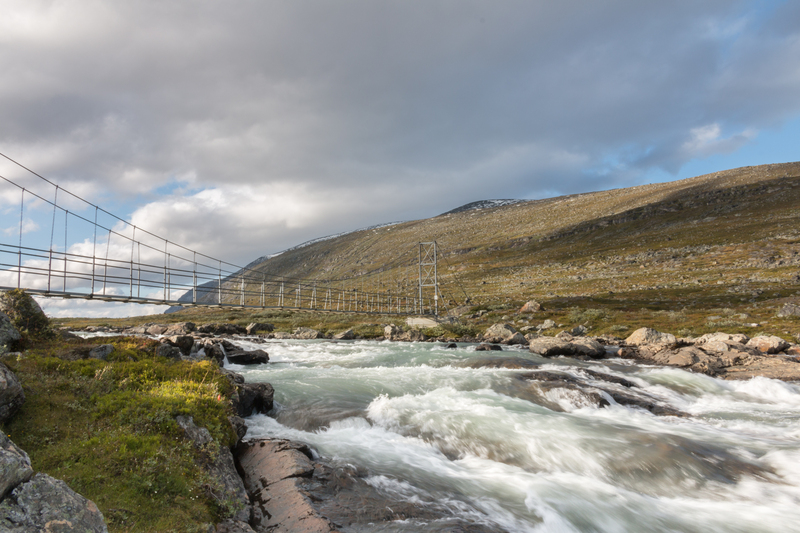 It takes about 2 days to reach the bridge into Sarek at the Guhkesvagge. 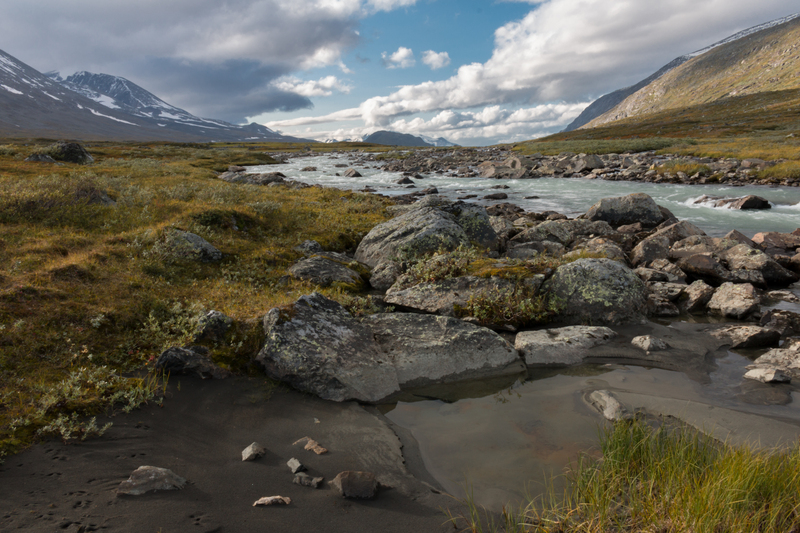 All the way at the end of the road you will reach Ritsem where you can cross by boat and walk on the Padjelantaleden for 1 day before you can leave the trail into Sarek. 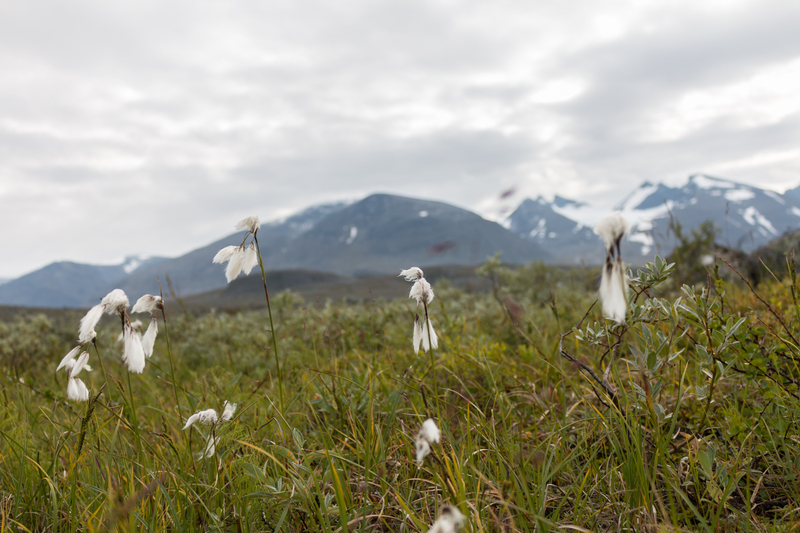 Coming from the South you can follow the Kungsleden all the way to Aktse or at any point leave the trail and cross into Sarek. 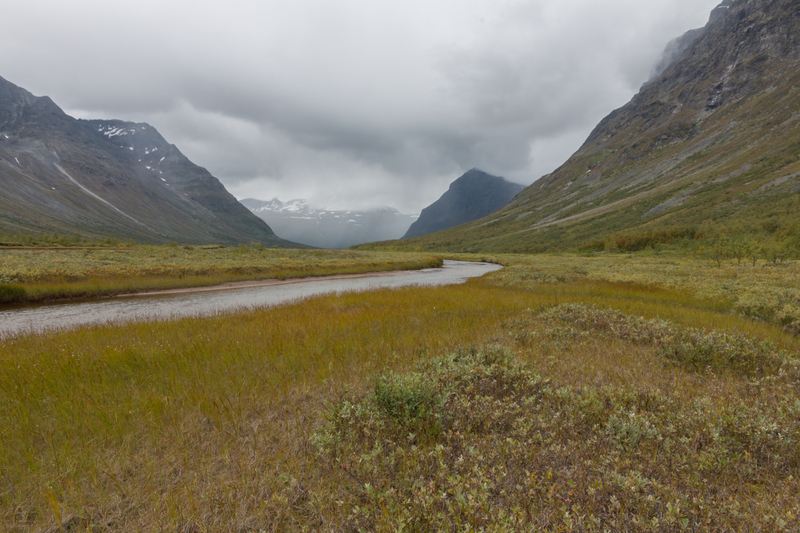 I must admit I was a bit nervous before heading out to Sarek. I did quite some research on the subject and read many stories about rough weather and difficult terrain. I tried to prepare as good as possible and chose a route that would be doable in about 9-10 days. I am a experienced hiker and did many rough hikes in the past but this was going to be a different story. I will go more into detail about what gear I took and how I prepared for the trip on all levels (food, equipment, route planning,…) in one of my future blogposts. 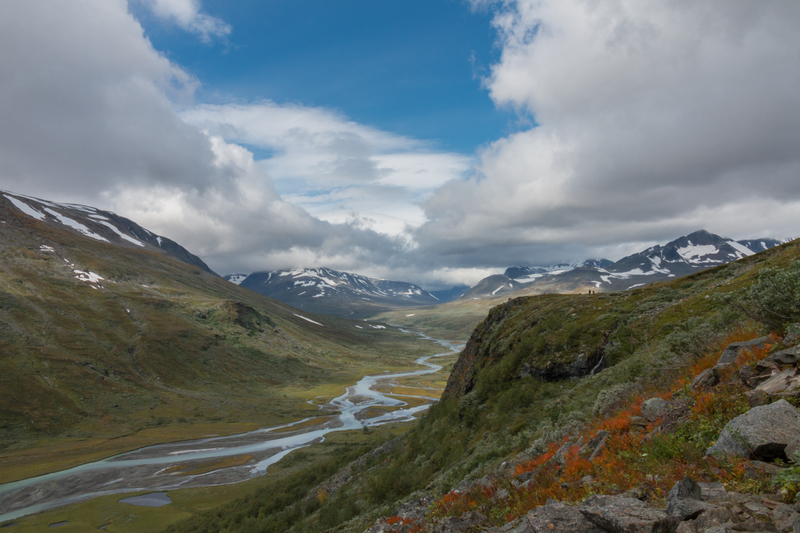 But this one will be about my experience and my time in the Sarek Mountains. I had a nervous feeling in my stomache during the bus ride from Gällivare to Suorva dam. 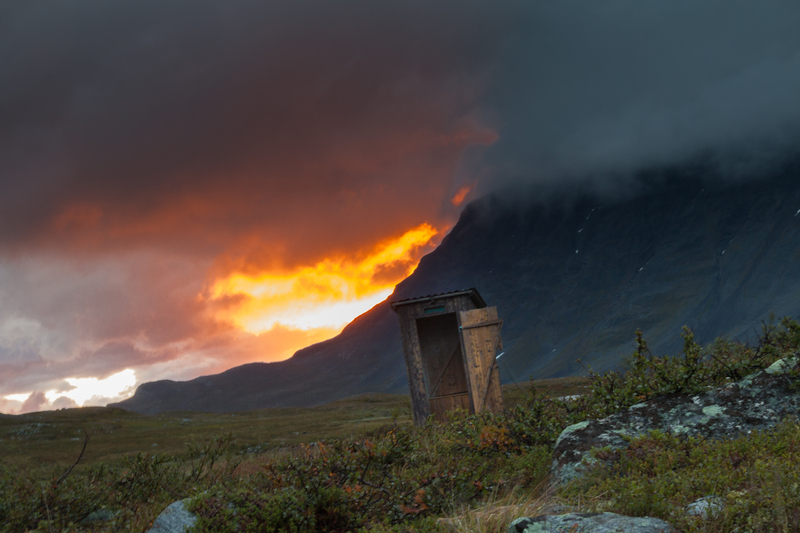 The ride takes about 3 hours from which 1 hour is just waiting at Stora Sjofallet mountain hut. This is your last chance to buy some stuff you need. From there it is a 15 minutes ride to Suorva. The bus dropped me off at the small parking lot near the entrance gate of the dam. My adventure was about to begin. It was 16h30 and the weather was not really that good. Overcast and a bit windy. After readjusting my backpack I opened the small door in the gate and started hiking. There was a feeling of excitement and expectations. But also some kind of fear or anxiety because you never know what nature will throw at you. I was setting foot in new territory. The real wild. Where not many had gone before. Crossing the dam didn’t take that long. I Just followed the 3 km road to the other side where there were a few wooden houses and a reindeer corral. I took a left and followed the gravel road to the end where the corral ends and discovered a small trail to the right that followed the fence. This is where the battle began. In the beginning the trail was quite easy to follow. Just until a small wooden bridge over a river. From there I lost it as many times as I found it again. It was a struggle. Deep swamp, fallen trees and roots. I had to turn back many times because there were rocks or swamp I couldn’t cross. Luckily I had a lot of energy even though my backpack was about 28 kg. After 3 hours it finally opened up and the trees got smaller and smaller and I could distinguish something you can call a trail. As soon as I reached the bigger river Njavvejagasj coming down from Vuosskelvage I decided to call it a night. It started to drizzle so I prepared my food in a hurry and hit the sack! I love the sound of soft rain on the roof my tent. Slept like a baby! Waking up with the first daylight is the perfect way to start your day. It stopped raining so I could just take it easy and prepare my breakfast. My backpack was still heavy so I knew it was going to be a rough day. I read many horror stories about the rocks, swamps and river crossing that were ahead of me that day. After 10 minutes I reached the Njavvejagasj river I had to cross. For some reason everyone seems to choose about the same spot to cross because all the trails lead to 1 point. I was intimidated because I never did a river crossing in my life! I changed into my river crossing shoes and while I felt my heart beating in my throat I took my first steps. The water was freezing cold but my neopreen socks kept my feet surprisingly warm. But the water got deeper than I hoped and I got a bit scared and didn’t really know where to go so I decided to turn back. The second try was better! I took a gamble and slowly moved forward. The water just reached above my knees and a few steps later I was nearly at the other side. I felt relieved and somewhat proud because this was my biggest worry before leaving on this trip. But this wasn’t the end of it! My plan was to at least reach the bridge in Guhkesvagge. That would be about 15 km. Once I reached there I would see how much energy was left to keep going. It would become a long day. It was difficult to find a trail and follow it. There were lots of rocks and swampy areas and few river crossing which were not really that difficult. Keeping my feet dry seemed impossible. I was very happy I had my trekking poles because without them it would have been a mission to stay standing while crossing the rocky fields. They also came in handy to check out how deep the swamp was in front of me. The closer you get to Guhkesvagge the more distinct the trail becomes. 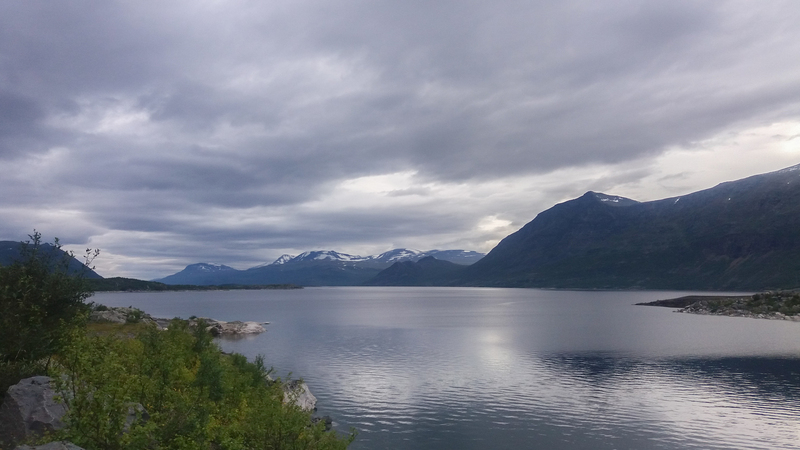 It was amazing to get a first glimpse of the high peaks of Sarek in the distance. I didn’t meet a single person. The last bit is quite straightforward. 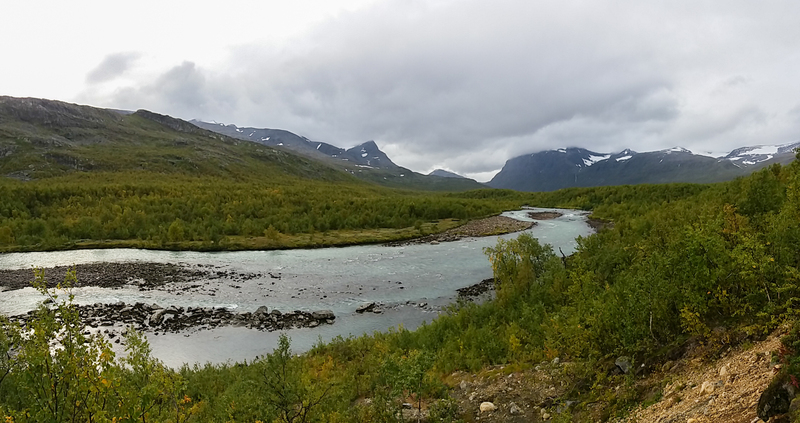 It took me about 7 hours to finally cross the bridge and set foot into Sarek National Park. I was exhausted! I decided to setup camp just across the bridge. It was getting cold and windy. I snuggled into my sleeping bag with the tent still open and saw an amazing sunset. The clouds seemed on fire and they were moving quite fast around the mountains. That mostly isn’t a good sign because it means strong winds are coming. The next day would be a fight against the elements! I could hear the wind high up in the mountains when I opened my eyes in the morning. It was chilly to get out of my sleeping bag. I opened the tent and saw it was still cloudy. It’s cool to see how the water level of the river changes. There was a small black sandy beach that wasn’t there the evening before. Mornings are mostly the best time to cross a river because the glaciers haven’t been exposed to the sun yet. 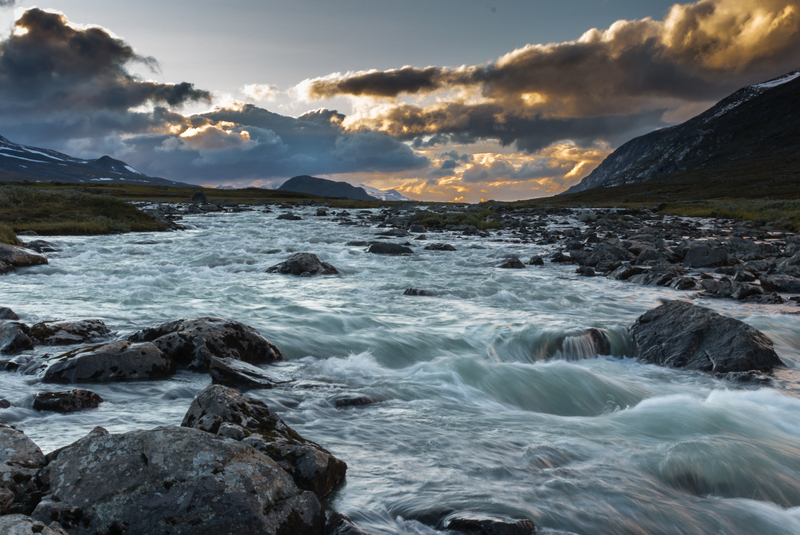 But the river in Guhkesvage would be nearly impossible to cross without the bridge because it kinda is a raging torrent with all the creeks and streams flowing towards it. 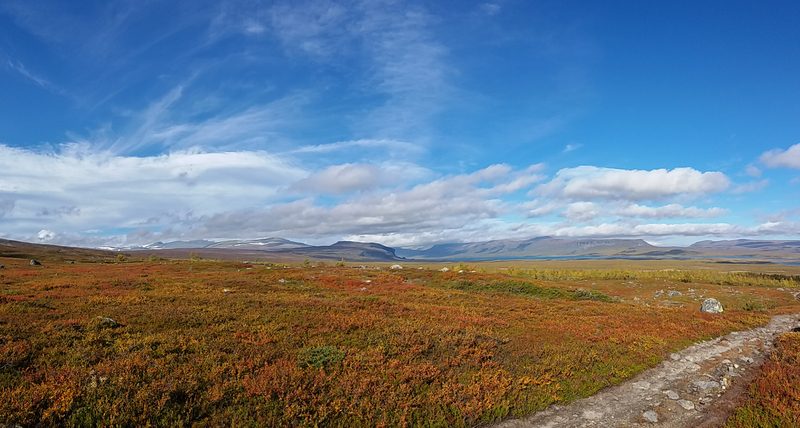 My plan that day was to reach to Pielastugan on the other side of the Bierikjavre lake. The trail was relatively easy to follow. I took a higher route around Vuonesjvarasj and Vuojneskajde. This wasn’t difficult at all and the views over the valley and Guhkesvagge were breathtaking. The clouds and the sun were playing games with the rain and I finally started to feel the connection with nature. I was getting into the wild. This only happens after a few days. This is why I love long distance multi-day hikes. You can fully emerge into the place and take time to soak it all up. 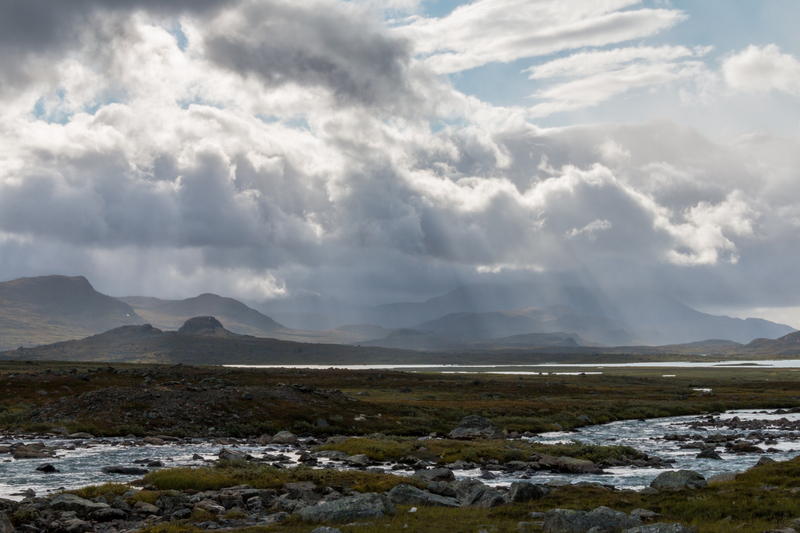 The clouds were moving fast and I could see it was raining in the valley towards Bierikjavre. I put on my rain gear and walked around the cliff towards the lake. From that point on the wind was full frontal. It wasn’t crazy strong but it was still hard work to walk against it over the rocks and many streams I had to cross. Most river crossings in this section and around the lake were relatively easy but I heard they can be challenging when it rains heavily because all the water gets channeled towards them. The lake looked beautiful and when the sun peeked from behind the clouds it showed it’s blue glacial colors to me. I also met two other hikers going the other way. As the wind was picking up I struggled for the last 2-3 km towards Pielastugan. I was hoping to put my tent up on the protected side of the hut but that seemed not possible. In the distance I could see dark clouds forming. Rough weather was coming. I quickly prepared some food and crawled inside my sleeping bag. The wind was freezing cold and when the first rain showers battered my tent I knew I was going to be in for a long night. I could barely sleep because my tent was making a lot of noise because of the wind and the rain. I could hear the wind build up in the valley and a few seconds later it would it my tent with full force. It was shaking like crazy. The night didn’t seem to end. At some point I fell asleep and when I woke up and opened my tent I could see the most apocalyptic sunrise I had ever seen. The sky was on fire with the clouds wrapping around the mountain! Mesmerising! The true and raw beauty of nature showing. These moments make it all worthwhile. The day started windy and cloudy and I decided to break down camp fast and then eat some breakfast. But the weather slowly changed and the sun started to peek from behing the clouds and the wind disappeared while I was eating. The plan was to go over Laddebakte and catch my first glimpse of Rapadalen on the other side. But the climb from Spokstenen to the Laddebakte saddle seemed menacing on the map. I was preparing for a heavy hike. From Pielastugan I tried to find a place to cross the river. This meant following the it for about 2.5 km and then walk back towards Spokstenen on the other side. But the sun was out and it looked like it was going to be a great day and that was such a relieve after the crazy stormy night. I was a bit to low in the valley and ended up in the swamp below. Just stay higher up on the ridge and aim towards the left side of the bigger rock you can see on the ridge. From there I found the trail that was leading towards the ridge to Laddebakte. After a few minor river crossings I reached the climb to Laddebakte. It looked quite sketchy! From a distance I couldn’t really see a path but it was quite obvious to find out where I had to go. There was only 1 option. On the left the cliff went nearly straight up and on my other side it dropped quite steep down. Loose rocks and roots made it quite the challenge. Especially with a heavy backpack. I had to go slow and step by step trying not to slip or fall. Some parts where just loose rocks and pebbles. It took me a while to reach the other side of the cliff and the last climb towards the saddle of Laddebakte. The views are breathtaking! Giant glaciers and waterfalls on the mountains in front and the river running below in the valley. The section on the saddle was really beautiful. The wind was completely gone and for the first time I could feel the warmth of the sun on my face. Time for a long lunch break and some chilling out! The grass and the flowers looked amazing in the light of the sun. After a short climb at the end of the valley I could finally lay eyes upon Rapadalen. I was considering staying at the top but because I still had quite some daylight left and didn’t feel like setting up camp I decided to descend into Rapadalen and camp near the river. The descend is quite straight forward if you stay on the left side of the river. I stayed on the right side which made the last part a bit tricky because I had to struggle through some bushes, swamp and rocks to cross the river lower in the valley. I found a really nice camp site close to the river. The evening was so peaceful. An amazing sunset with not a puff of wind. No other people around. I took a bath in the freezing cold river and made a camp fire and just took it all in. This is what you do it for! My connection with Sarek started to grow. I started my hike by following the trail though the forest and trees. But when I lost the trail in a rocky outcrop I saw two other hikers walking next to the river. Because the water wasn’t that high it was possible to hike on the sand. I decided to aim for the river as well to make the hike a bit easier. It was a bit difficult to battle my way through the bush and swamp but after 5-10 minutes I reached the river bed. Turns out it were the 2 german guys I met on the bus before. In the distance rainclouds showed up so I put on my rain gear and continued the hike next to the river. 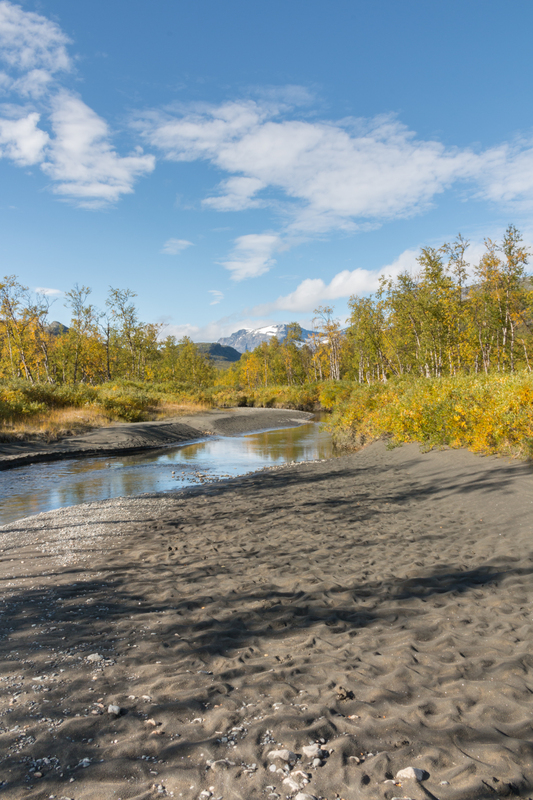 It was a relief to hike on the sand and trail that was on the riverbank. I had to cross a few rivers which were luckily just gently flowing streams. But I can imagine they are difficult to cross with heavy rain because the water reached almost 15-20 cm above my knees. Once I reached Alep Vassjajagassj the trail next to the river ended. 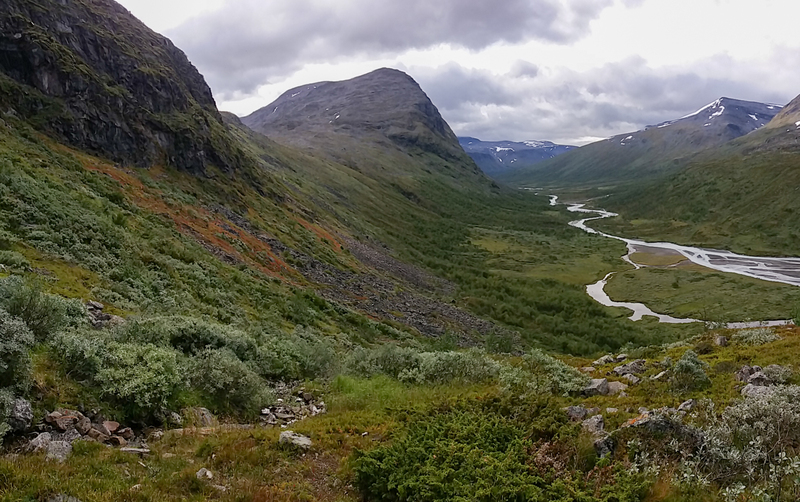 I had the option to follow the river higher up and choose the high route into the mountains or stay in Rapadalen. 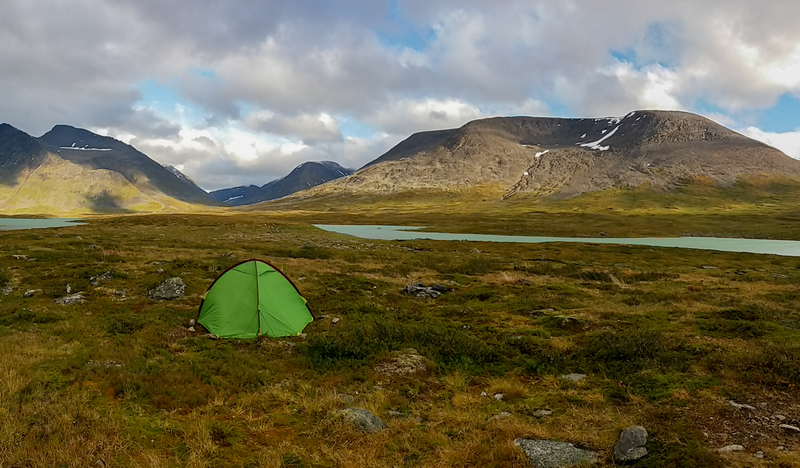 I read about a great camping spot with an awesome view near Alep Spadnek so I decided to stay in Rapadalen and head there. And what I read was true for sure! Great view over the valley and the river below and lots of space to setup my tent. The clouds in the distance seemed dark and menacing and it looked like rain would arrive any moment but for some reason it never happened. The sunset was spectacular with weird cloud formations and bright orange and red colors. I woke up in the middle of the night to pee and I was amazed to see some vague northern lights racing across the clear sky! Quite a nice surprise to wake up to! This day was as straight forward as it can be in Rapadalen. Some swampy areas and from time to time difficult to walk through the trees and bushes. The weather was so nice this day and I took a long break at around km 5 where Buovdajagasj reaches Rahpaadno. Lovely sandy beach with a slow flowing river. Perfect for a bath and some running around naked! The last part before reaching Namasj, the big rock in the middle of Rapadalen, was a bit harder because the trail kept dissapearing. Because most people take the high route above Rapadalen I didn’t meet anyone this day. There is a camping area where the trail ends at the bottom of Namasj. It is a bit tricky to reach the water here because the river bank drops down about 75 cm to 1 meter. But I found a spot to get down to the river. I had a early night because day 7 would bring lots of climbing! Day 7: The wrath of Rapadalen. I woke up a bit earlier because I was going to hike to the top of Namasj to have a different view over Rapadalen. The hike towards the summit is actually pretty straight forward and the view from the top is spectacular. 360 degrees view over the valley and Skierffe right in front of you. Amazing! But the biggest mission of the day was getting to the saddle/plateau below Skierffe. There was no trail at all and it was quite rocky and swampy. I had to battle my way through trees and bushes. Just keep an eye on the top of Namasj and follow the contour of the mountain until you reach a bigger swamp and grass field on the other side. From here you will be pushed east back towards Namasj and around this swamp. At the end of the swamp just turn back north-east and head towards the mountain you see in front of you. There is a waterfall coming down in the distance. This should be your aim. But expect difficult terrain. Swamps, small creeks, rocks, trees, bushes and rivers. It was a battle and it got quite steep at some point. It took me ages to reach the tree line from where I could finally turn east again and reach the top of the mountain and the Tjasskavarasj river. I decided to call it day because I was totally exhausted! 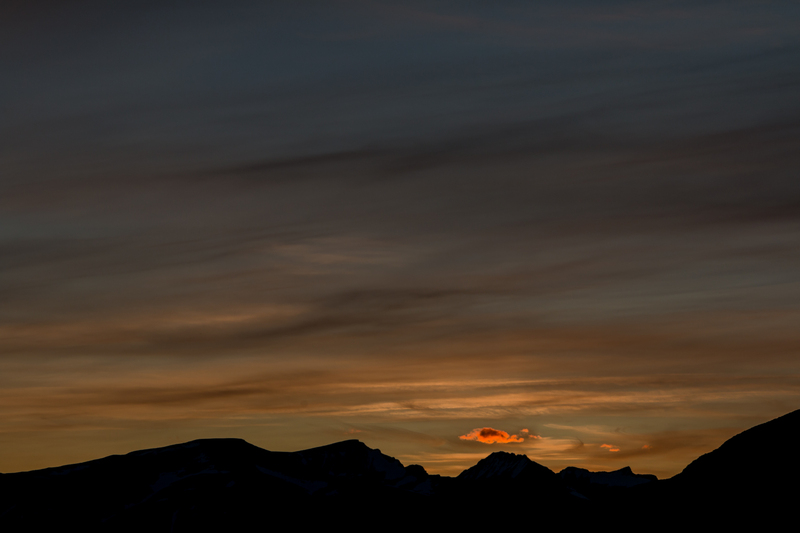 It was a very calm evening with clear skies and the most beautiful sunset I had seen in ages. When the full moon rose just behind Skierffe I felt like on a different planet. Such a surreal view looking down to Rapadalen and Namasj with the sun setting and the moon rising. The night was extremely cold and I was shivering most of the night because my sleeping bag got wet because of condensation. There was a small aurora show around 2 AM when I woke up to go for pee. There was also frost on my tent for the first time. As soon as it was getting light I decided to get ready to hike to Skierffe because I needed to get moving to warm up. The hike to the top of Skierffe is very easy. Just aim towards the top and find your own way. It took me about 2 hours to go up and down. 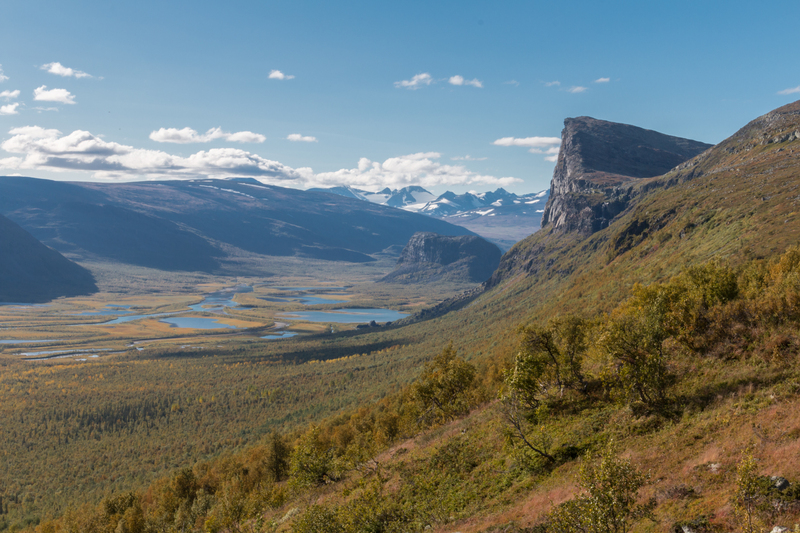 I couldn’t have hoped for better weather because there was not a single cloud in the sky and Rapadalen was showing it’s true colours and I could see all the mountains in the heart of Sarek. I took it easy breaking down camp and tried to dry my sleeping bag and hiking boots in the welcoming sun. It felt like a nice spring day at home. Today I was going to hike to Aktse. Because it was such a great day I decided to take the long route around Bassoajve. Such a peaceful hike in shorts and t-shirt with hundreds of reindeer running around. The trail is quite easy to follow with some rocky sections but nothing crazy. 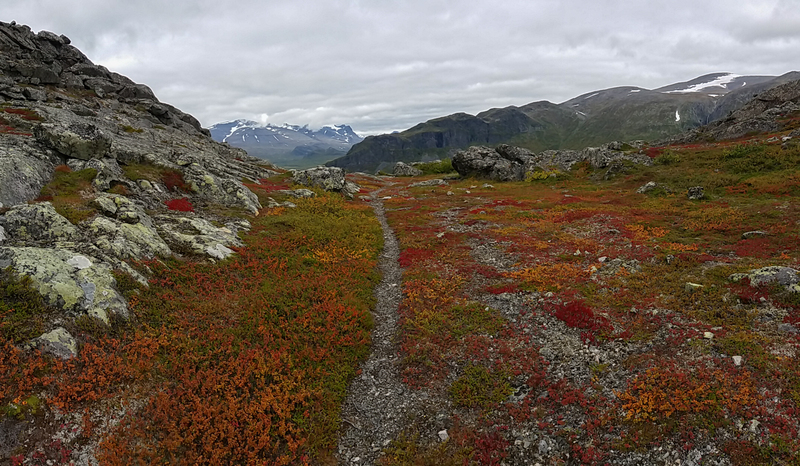 After 8 days of hiking in Sarek I started to recognise the terrain and knew exactly where to go and where not. The descend into Aktse was quite straight forward. 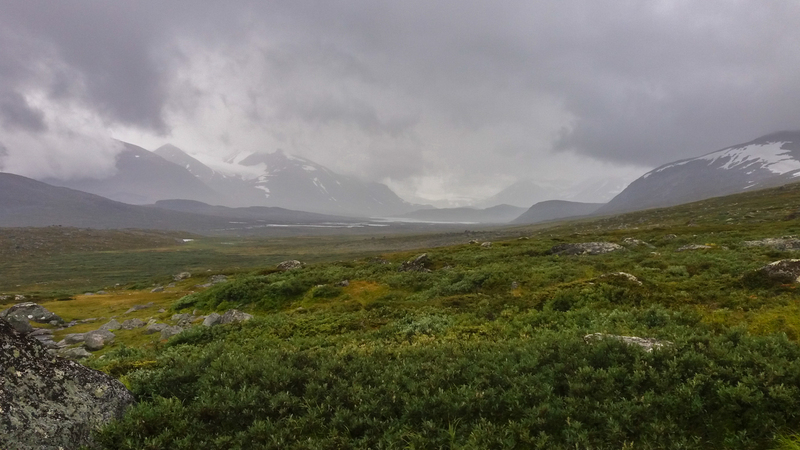 As soon as I got on the Kungsleden there were a lot more hikers. Such a difference! Back in the real world. I met some Austrian hikers on the way down and we setup camp next to the lake. 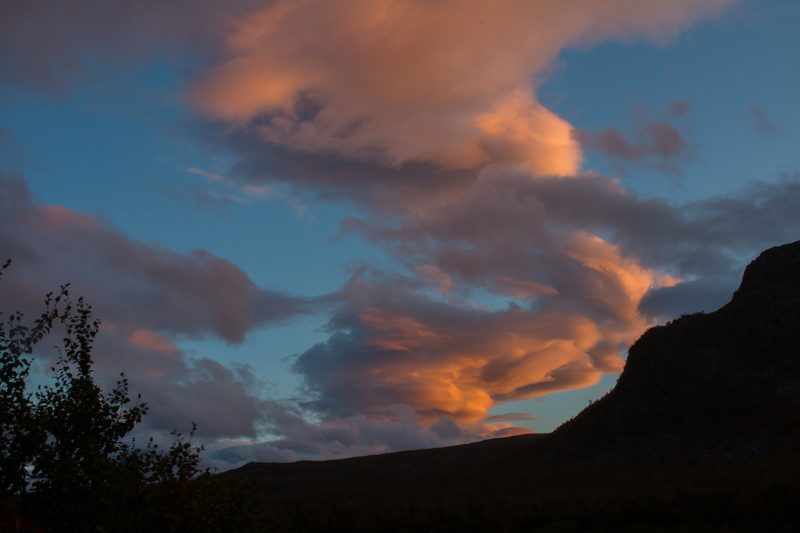 After a freezing dip/shower we had dinner together and shared our stories from Sarek with Skierffe in the background. The night was freezing cold again and there was a great aurora show around midnight. From now on the plan was to reach Saltoluokta as fast as possible/enjoyable because I needed to take the boat and the bus back to Gällivare. We hiked over the mountain behind Aktse to Sitojaure where we had to wait for the speedboat across the lake. You could feel that autumn was kicking in. The wind got a lot colder and the true colours of autumn showed up. It goes so fast in this part of the world! In just a few days everything turns yellow, red and gold. At around lunch time we arrived at Svijnne. But we had to wait until 8 PM before the speedboat showed up! This was because the low season schedule started. Normally the boat runs at 9 AM in the morning and 5 PM in the evening. But it was great to chill at Svijnne and share stories with the other hikers that were waiting. Once on the other side we hiked in the dark with the full moon shining brightly. But winter was coming. The wind picked up and it got freezing cold. When we reached the Autsutvagge shelter between Sitojaure and Saltoluokta just after midnight we were frozen and hungry. We ate all the food we had left and decided to spend the night in the shelter because the wind was howling outside. 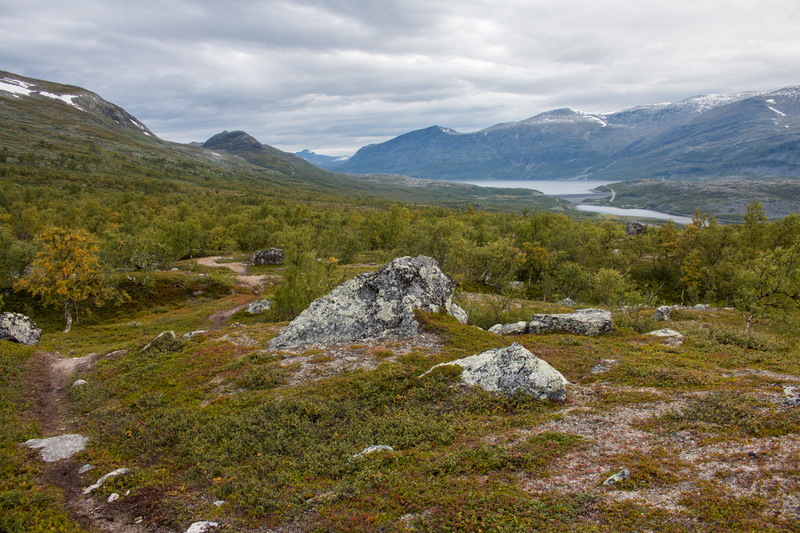 The last part of the hike towards Saltoluokta was mostly downhill. A beautiful autumn hike. Once I got across the lake and on to the bus the tiredness kicked in. I fell asleep straight away. Once I arrived in Gällivare I just had enough time to have shower and a saune, eat pizza and drink a beer before before I took the night train back to Stockholm. It was a great ending to a perfect 10 days in the wild! 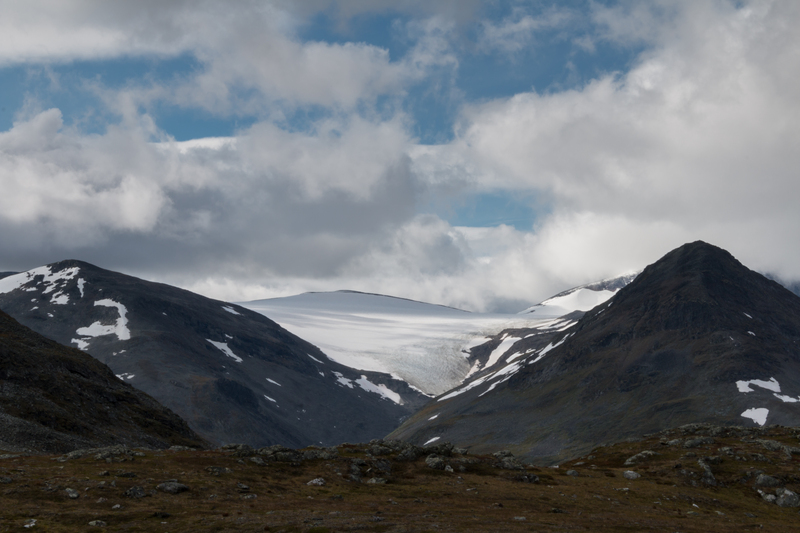 So what did I learn from my time in Sarek? First off all you need to good quality equipment. My tent, sleeping bag and sleeping mattress were barely good enough. The tent could withstand the wind and the rain but it shouldn’t have been much worse than it was. Overal I was very lucky with the weather with no extreme rain or wind. Just a bit of a stormy night. My mattress wasn’t isolating enough and near the end of the trip it got colder and I could feel the cold coming up from the bottom. Again it was just at the limit. Next time I will bring a different tent and a better sleeping mattress. I am looking into the Exped Downmat 7M because it can insulate upto -20 degrees. The trail conditions were a bit better than expected. Ofcourse there were very rough parts but I thought it would be much more difficult to find a trail. 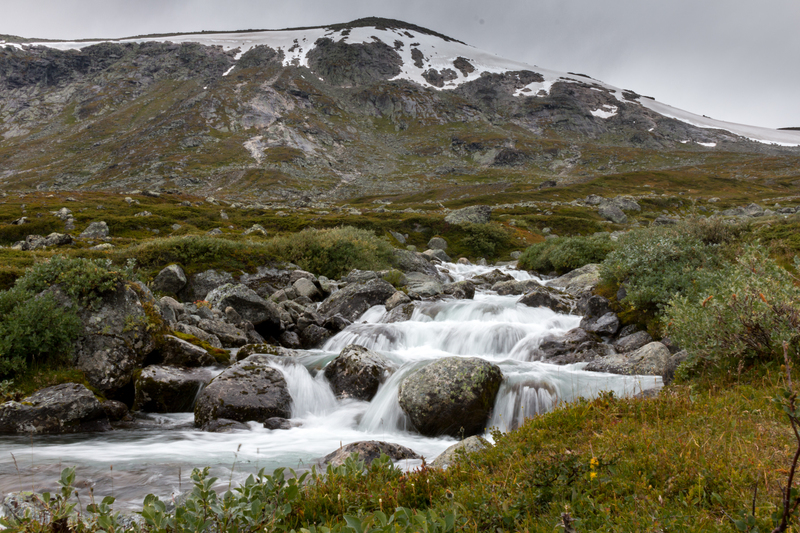 Once I reached the Guhkesvagge bridge there was always some kind of trail to follow. You just need to be prepared to struggle through rocks, swamp, mud and bushes. If you don’t like this than you need to stay away from Sarek because you will not have a good time, hehe. The sketchiest part is the crossing over Laddebakte. You need to be strong on your feet and take it very easy. There were many river crossings on my route and most of them were very doable because there was not a lot of rain. But I bet some of them can be very challenging when it rains a lot or at in spring and beginning of summer when the snow melts. Foodwise it’s all about calories and energy. You need to eat between 2500-3000 calories per day. Make sure you bring compact high calories/energy food. I noticed that if I didn’t eat enough on a certain day I would feel it the next day. So make sure you eat and sleep well. But more on that in my next blog post! I really really really loved the time on my own. Although I met more people then expected I was still alone for 60-70% of the time. It was amazing to feel so connected to nature. Just enjoying the sounds and feelings of nature. Watch the clouds move and hear the water flow. Sit on a rock for hours and watch the sun set and turn the sky red. Waking up in the middle of the night and see the aurora dance between the stars. Taking my time to cook next to the river and drink fresh water from the streams. Running around naked in the warm autumn sun and freshen up in the freezing cold rivers. These are the things I long for so often. This is when I can be me. Far away from the distractions and influence of society. No internet, no facebook no messages, no people. Just me. I wish I can bring that version of me into real world someday. My next trip is already in the pipeline. Probably cross country skiing from Norway to Sweden next march! And Isley of Skye end of May. Good times ahead! Thanks for reading! Feel free to comment or send me a message if you have any questions. Supermooi verslag, Tom! Heerlijk geschreven. Alsof ik er zelf loop. Hello Tom, great article and awesome pictures. 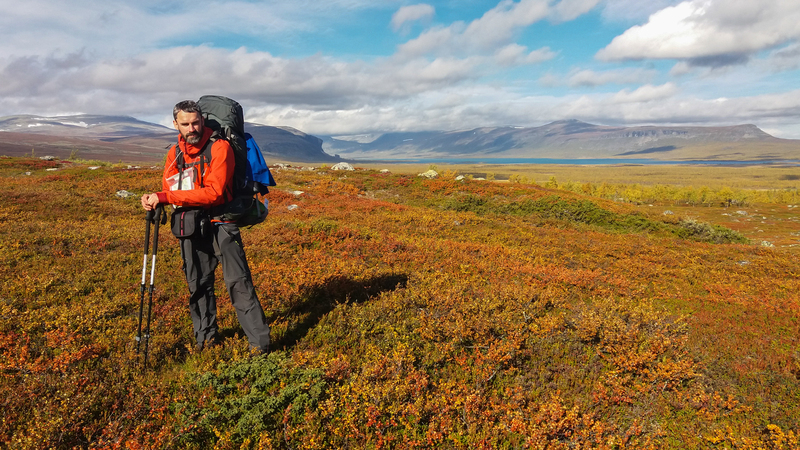 We are heading into Sarek this summer and I was wondering if you also have (and are willing to share) the gps track of the trek. Thanks for the nice comment! I will send you the gpx files by email. Keep in mind that I was trying to find my way and that it wasn’t always the most convenient route. You can use them as guide line but don’t take it 100% for granted. Conditions might force you to take a different route. For example, the river crossings might be at a different spot depending on the water level. Let me know if you have any other questions! Thanks for sharing your adventure. I appreciate it so much! 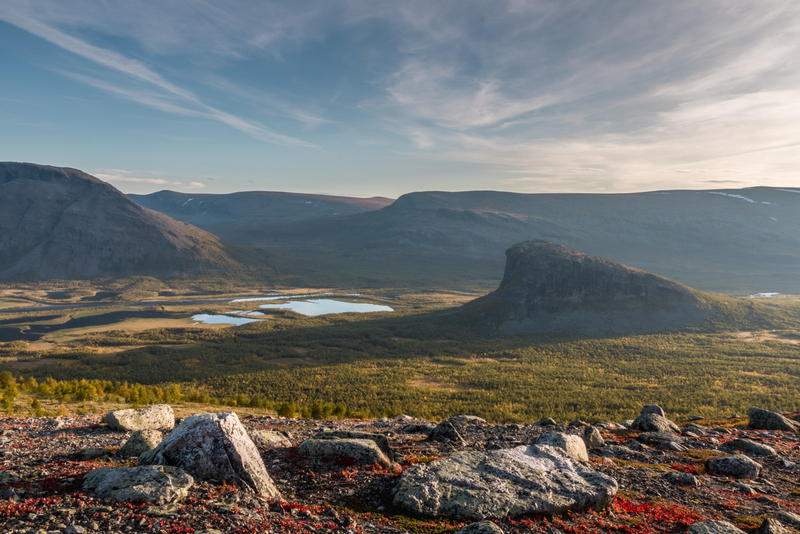 We are planning to venture Sarek next year. wish us luck! You are welcome! I am heading there again as well next year end of august. Have a great time guys!